Psychoanalytic perspectives on the creative arts are not new; for example, Austrian psychotherapist Melanie Klein (1882–1960) offered a thematic analysis of the paintings by Ruth Weber and the film Citizen Kane (later published by Olsen, 2004, and Mason, 1998). In the latter, the loss of an aspect of the childhood-self and the futile desire to reconcile this loss in the face of death present key Kleinian concepts. Recently, the film adaptation of J.R.R. Tolkien’s The Lord of the Rings trilogy attracted similar interest because of the existential themes of finding meaning in unavoidable suffering (Schulenberg et al., 2004). Melanie Klein’s theory, although focused on the earliest months of a child’s life, has salience throughout the lifespan where the pervasive splits between good and evil are reworked throughout life (Feak, 1992). This article illustrates the reactivation of the Kleinian positions, named, ‘paranoid-schizoid’ and ‘depressive’ (see box), through a developmental analysis of Frodo Baggins in Tolkien’s The Lord of the Rings. References are made to both the book and Peter Jackson’s film interpretations of Frodo’s journey. Both Klein’s theory and Tolkien’s story emerged during a volatile time in Europe: the Great War, the rise of Nazism and the Second World War. Tolkien was undoubtedly affected, both by his time served in the First World War and seeing his son Christopher head off to the Second. John Ronald Reuel Tolkien joined the army after completing his degree at Oxford University in 1915. Within a year he was in the trenches at the front line at the Battle of the Somme. Many fighting alongside him were killed, whilst he escaped uninjured. He returned to England soon after with ‘trench fever’, changed from his experiences of the horrors of the Somme and the death of his closest friends (White, 2001). Melanie Klein’s husband Arthur also returned from the front line a changed man; their marriage suffered as a consequence. Both Tolkien and Klein were simultaneously made aware of the fragility of life and futility of war. This realisation of the human capacity to annihilate further impacted on Klein, who was forced to flee to England in the context of growing anti-Semitism in Europe. At the time of its publication Tolkien’s work attracted notions of anti-establishment or anti-nuclear messages, which irritated him immensely. He said, when pushed, that the theme of The Lord of the Rings is death (see Foreword to the second edition). Tolkien’s concept of death is similar to Vygotsky’s (1978), who said that to develop is to die. The Ring presents a special challenge to those who come close to it, and it is through their response to this that characters develop (again a Vygotskian concept: the zone of proximal development). In Kleinian terms, development is seen as striving towards resolution of conflicting states (Hinshelwood et al., 1997), particularly the oscillation between paranoid-schizoid and depressive positions (Bion, 1963). Frodo’s quest to destroy the Ring, before it destroys him, is a powerful story punctuated by choice points where the solution is not always obvious, and the outcome is never certain. Set against a stage of war, the real battle is an internal, psychological struggle. Although Klein’s theory is referred to as an ‘object relations theory’, the word object should not be taken too literally. The focus should be on the word relations, a dynamic process occurring between the individual and the object. The One Ring, therefore, is not the object – the ‘objects’ to which Frodo relates are Gollum, a strange creature, twisted after his time spent as a ring-bearer, and trusty, down-to-earth Sam. Klein (writing at a time when child-rearing was perhaps more regimented than today) describes the child in an intolerable state of anxiety, in the face of potential annihilation. To survive, the child develops defence mechanisms such as splitting. So, for example, the child is in the crib wailing for food, with no idea when or if ever it will be fed. The mother enters and feeds the child and the anxiety is quelled; however this is temporary because when the feeding stops and the mother leaves, the child is anxious about when the next feed will come. The Kleinian analogy for this is ‘the good breast, bad breast’: the splitting of the mother into the mother that feeds and the mother that abandons. In The Lord of the Rings, the good object, in Kleinian terms, is the hobbits’ home, the Shire; the bad objects are beyond the Shire’s borders. This splitting of the world into goodies and baddies (the paranoid-schizoid position) is typical in early childhood; however it is also common in adults. It is far more tolerable to think of people as either all good or all bad, than to consider that people can be both. Frodo knows that if he remains in the idyllic Shire, evil will infiltrate and so he sets out. This is a parallel process of the young men who went to war in 1914–18 in an effort to keep ‘evil’ away from their homeland. But the evil encountered was just like them: young men, fighting for the same things: their home, their family, and their lives. The paranoid-schizoid position is fragile and challenged constantly; Frodo’s first challenge is to see the hobbit Sméagol in the wretched remains of his alter ego, Gollum, a good hobbit turned bad. Klein’s distinction between depression and the depressive position is played out in Frodo’s pity. When he pities himself he becomes depressed, suffering a kind of psychological death: the loss of hope. He loses a sense of who he once was; no longer able to trust himself, or continue resisting the compulsion to use the Ring. Frodo surrenders his despair initially to fate but most importantly to Sam. But when he truly pities Gollum he no longer splits, assimilating the good and bad objects internally. This introjection or acceptance of both good and the bad parts of the self is essentially a maturing and loss of innocence. This is arguably one of the most challenging developmental processes. For psychologists, the challenge to move from a paranoid-schizoid position is palpable in forensic settings. Here the struggle to therapeutically hold both the villain (Gollum) and the victim (Sméagol) parts of the client together is crucial to avoid transferential relationships, where the therapist is invited to play the part of either the victim or the abuser. 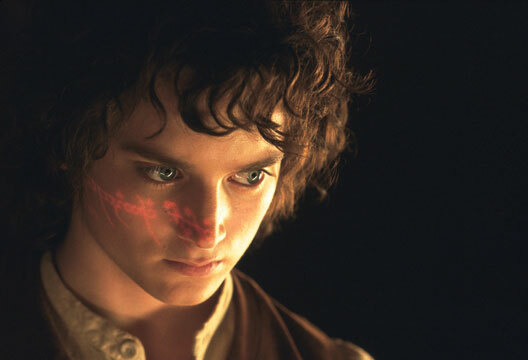 This development through Frodo’s inner conflict is not linear, although it is progressive. The knowledge and wisdom Frodo ultimately achieves as a consequence is overwhelmingly damaging. Understanding the potential to be corrupt and kill he wonders if he can remain in the Shire when wounds, physical and psychological, refuse to heal. Seeking counsel from the elves, he decides to leave Middle-earth for ever. While Klein presents a negative perspective of the child in a state of intolerable anxiety, her theory offers an optimistic view of surviving insurmountable suffering. Similarly, in The Lord of the Rings, Frodo, suffering increasing physical and psychological torment, without any reason to hope, continues with his self-appointed impossible quest. Here, the fight to carry on is an adaptive defence against death: a hopeful response to the depressive position supported in survivor stories and the concept of resilience. This developmental view also offers an optimistic perspective in psychology, which is otherwise dominated by discourses of damage and disorder. The challenge for psychologists is to be alert to tales of everyday heroism and to be less quick to pathologise the struggle. - Paula Jean Manners is a trainee clinical psychologist at the Centre for Applied Social & Psychological Development, Salomons, Canterbury Christ Church University. E-mail: [email protected]. These concepts share the same terminology as psychiatric states of ‘paranoid-schizoid’, ‘psychotic’ and ‘depressive’ but are not equivalent to their psychiatric use. l We are born in a state of psychotic anxiety. ‘Psychotic’ refers to individual experiences of this anxiety. l A defence against this anxiety is to split the world into good and bad objects: the paranoid-schizoid position. l The depressive position occurs in the knowledge that good objects are flawed. This is different from depression, where the loss of the good part of the object is mourned. Bion, W. (1963). Elements of psycho-analysis. London: Heinemann. Reprinted 1989 by Karnac. Feak, M. (1992). Kleinian contributions to a life span psychology: Preliminary considerations with some interpretations from folk tales and literature. Journal of Melanie Klein and Object Relations, 10(1), 46–61. Hinshelwood, R., Robinson, S. & Zarate, O. (1997). Melanie Klein for beginners. Cambridge: Icon Books. Likierman, M. (2001). Melanie Klein: Her work in context. London: Continuum. Mason, A. (1998). Melanie Klein’s notes on Citizen Kane with commentary. Psychoanalytic Inquiry, 18(2), 147–153. Olsen, O.A.(2004). Depression and reparation as themes in Melanie Klein’s analysis of the painter Ruth Weber. Scandinavian Psychoanalytic Review, 27(1), 34–42. Schulenberg, S.E., Madsen, W.S. & Melton, A.M. (2004). Meaningful cinema: Logo therapy and The Lord of the Rings. PsycCRITIQUES, 49 (Suppl 11). American Psychological Association. White, M. (2001). Tolkien: A biography. London: Little, Brown and Co.